If you saw Bobby Phillips out of his uniform, you'd probably guess he's a cop. Shaved-bald noggin. Stern-lip mustache. Solid stance, action ready. Alert eyes. And if you're one of those people who leans toward the wink-wink side of the law, he might make you fidget. As you should. 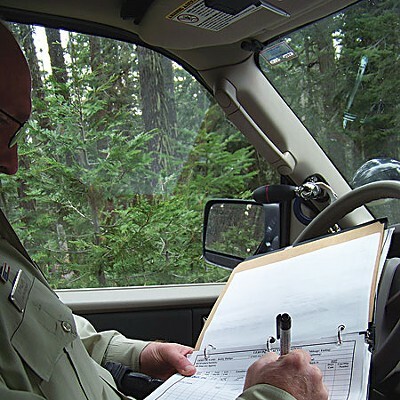 Phillips is a federal law enforcement officer (a "LEO," as they say), deployed to the river-cut mountainous domain of the Six Rivers National Forest's Orleans, Lower Trinity and Ukonom districts (the Ukonom's part of the Klamath National Forest, but is administered by Six Rivers). And he takes his job seriously. Too seriously, say some of the fidgety folks out on the Six. He's been shaking things up out there for two years now. Before him, there hadn't been a full time forest cop for years. "Every time he comes to Orleans he probably writes three or four tickets," grouched one man who didn't want his name revealed. "For mushroom collecting without a permit, for not tagging their wood, for riding quads on the wrong roads, for no helmet. I know two gals who got a ticket for no helmet. They were in the snow. And he [Phillips] actually was stuck in the snow, and they rode past him on the quad and he flagged ’em down and he wrote ’em a ticket for no helmet. A hundred and fifty dollars. One of the gals said something smart to him, and he wrote her up for another $50." "We're so far out in the middle of nowhere," he said. He paused, then added, "The guys before him never hassled people." But what really ticked the man off, he said, was the time that Phillips drove down to his house looking for his son. Someone had set a fire on the side of a road, and somebody had implicated the man's son. Turned out the son had an alibi -- he was off fighting a fire elsewhere, ironically. "I called Bobby at his office and told him it was really rude to go to my house without my permission," said the man. "He told me he was a federal officer and he didn't need to ask me for permission to go to my house." The man called Phillips a regular "Bobby Boucher" -- you know, that guy in the movie Waterboy, all tough-guy cop with his Southern accent. "He come in here to clean the town up." On a Friday morning in mid-January, I met Phillips at his office in Willow Creek at the Lower Trinity Ranger District Station, on Highway 96 a short jog from the junction with Highway 299. He'd agreed to take me out on patrol with him. Inside the station everyone was ramped up, mapping out emergency road closures in advance of a pile-up of storms. I followed Phillips to his office, where he apologized for the clutter; he'd been setting up a temporary desk for the rookie LEO who would soon be taking over patrol of the Orleans and Ukonom districts, leaving Phillips with the Lower Trinity. Phillips is 42 and trim, except for his bulky chest; he always wears a bulletproof vest under his Forest Service-issue khaki shirt, even though it's not officially required. He's fair-skinned and strong-jawed. Southern-spoke. Taciturn, but friendly. His great-grandfather was full-blood Cherokee. His grandmother lived a short time on a reservation. He and his siblings grew up on a North Carolina farm "way out in the sticks." "We never went to town," he said. "We hunted and fished and grew gardens. We grew tobacco and tomatoes. We had to cut firewood, milk cows, get eggs, kill chickens and clean them." After high school he became a seasonal smoke chaser for the state forest service. 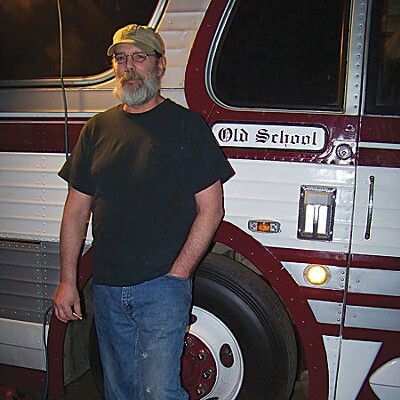 He fought structure fires as a volunteer for 10 years also, but was drawn more to the woods. He served on three National Forest hotshot crews and was sent all over the country, including to New York City for 9/11. After a couple of decades fighting fires, he decided to become a forest LEO. The Lower Trinity, Orleans and Ukonom districts make for some big country, just shy of 700,000 acres. Phillips can put in 400 miles on a summer day, and up to 16 hours. We went outside a little after 9 a.m. The sky was a gray pearl, inside which a blurred dot of yellow sun pulsed. A day neither threatening nor sunny. Phillips grabbed a small black case from behind the driver's seat of his rig. "Gunshot kit," he said. "If anything happens and I get shot, just open this up and pour the powder on the wound. Stops the bleeding." Also, if we did end up in a shootout, I should run. "Don't stay in the vehicle. Get out and run into the woods. A vehicle is a deathtrap." 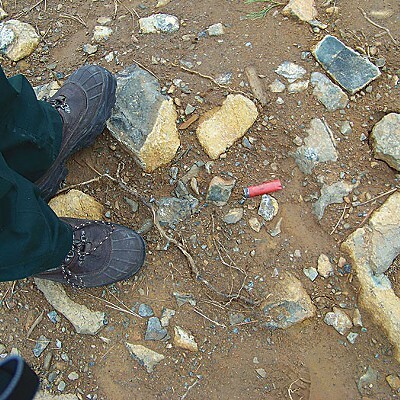 Looking at Phillips in his bullet proof vest and his belt bristling with weapons, I suddenly felt underdressed in my jeans, sweater and hiking boots. What's on the belt, I asked. "A Taser," he said. "Two magazines. OC Spray -- it's like pepper spray. Knife. Live firearm -- my duty weapon. A flashlight holder on the back. Gloves. Radio. Baton. Two sets of handcuffs. Twenty-one pounds; the belt itself is three to four pounds." Inside the rig, an AR-15 and a 12-gauge pump shotgun nestled between the two front seats. And tucked away somewhere were two more sets of handcuffs and one set of leg irons. 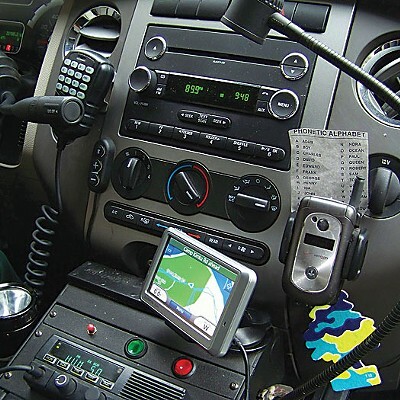 Before we drove away, Phillips put his coffee cup in the holder, called dispatch to make his first report, and wrote the first entry in his log book: Reported ride along. He put the log book away, started the engine, then patted the two fruit pies on the dash with his right hand. "When the caffeine runs out, I start on the sugar," he said. He doesn't eat much breakfast. Often skips lunch. "But there's some MREs in the back." We pulled away from the station and rolled down 96 toward 299. Phillips would be concentrating on the Lower Trinity this day. I'm just going to cut the tension right now. Nothing happened the entire day. No shootouts. No citations or foot pursuits or arrests. No expired registrations or busted tail lights or untagged fuel wood loads nor even any people in distress, or worse (Phillips has pulled five drowned bodies from the Trinity River). No pot-smokers. No poachers. No litterers. No expired driver's licenses. Practically no people at all, anywhere, to question about those things. It was weird. Unprecedented, said Phillips at the end of his patrol around 7 p.m. He figured I was some sort of good-luck crime repellant. Because it had been a nice enough day, the first day of a three-day holiday weekend. And a Friday -- people like to go out on the Six on Fridays. Also, with that big storm coming, people should have been out there hurrying together more firewood. We checked out all the day use areas, a couple of them in the morning and again after dark. Big Rock, Trinity, Kimtu, Gray Falls, Hawkins Bar, Tunnel Flat. Leaving the empty Big Rock Access Area after the nighttime patrol, Phillips said that when he started this job two years ago he was busting people there right and left. At night, though the area's closed after 10:30 p.m., he'd often catch people in there selling controlled substances. In the daytime, they'd drive into the Trinity River and onto the river bar, tearing things up and leaking oil into the water. "Man, I was running ragged," he said. "Every time I'd go in here I'd be writing tickets and taking people's drugs away." That stuff still goes on, but not as much as it used to. Back on 299, Phillips did stop once to investigate a parked car on the side of the road at the East Fork Campground and Recreation Area. A man leaned into the car talking to a woman. Phillips got out, after running their plates to check for an expired registration or outstanding warrants, and talked to them briefly. Came back. It was nothing. "They said they're just eating lunch, and then they're going to walk up the creek because the woman's been away for 20 years and wanted to see it again," he said. "A lot of times when you see a vehicle parked like that, they're either broke down, or smoking stuff, or maybe up collecting forest products. I just ask them what they're doing, and watch their responses. People, when they fib, they give clues." After that, he made no more official contacts. Was it true, then? Had Phillips cracked down so efficiently, so assiduously, that nobody dared set foot in the woods now? Well, no. All that day, Phillips showed me abundant evidence of people no-goodin' around. Shocking evidence. Some of it tantalizingly fresh. We spent much of the day on National Forest Route 1, a narrow twisty blacktop that travels through a remote patchwork of public and private land, the latter notable for its roadside stump fields and uniformly young conifers. The route goes as high as 5,144 feet in elevation, and usually this time of year most of it is closed by snow. It climbs through fir and cedar and dips into rolling oak-dotted hills. 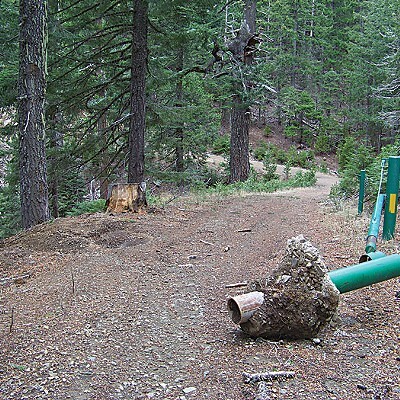 Along the way, myriad Forest Service dirt spurs lead to dead ends, hunters' camps, springs, hilltops, trails. People find all sorts of reasons to come in here: To gaze at the snowy far-off Trinities. To hunt. To listen to the wind in the trees. To camp. Also to dump their trash, shoot up refrigerators -- and living trees, shattering them to ragged stumps -- cut trees, party, abandon cars. 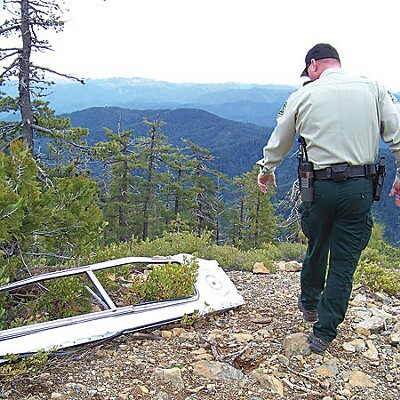 The forest service recovered 17 abandoned vehicles out on Route 1 last year, five of them stolen. At each spur, Phillips slowed to study the ground. If he saw fresh tracks or if the puddles in the road were muddy, he drove in to investigate. Often they led to illegal dumps: ugly strewn piles of crap in middle of the road or on the edges of streams and amid the leafy undergrowth. Couches, cushions, blue tarps, roofing material, chicken wire, burnt clothes, tires, all kinds of household trash. "That's an automatic ticket from me if I catch ’em," he said. "It doesn't bother me to go through somebody's trash..Trash can affect the wildlife. Sometimes they eat it and can't process it through their bowels. Or the chemicals get into the water." If he gets an ID, he's got a case. 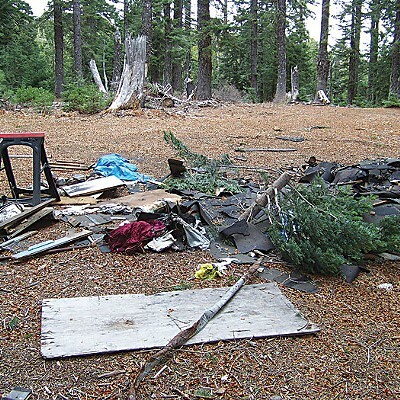 If not, the Forest Service has to clean it up. Recently his district cleaned up nine illegal dumps, filling up four commercial dumpsters. On Route 1, Phillips showed me five meadows, a couple of them private, where fourwheelers had driven around and around until there was nothing left but muddy ruts. He's still trying to catch the culprits. "In the spring there were a lot of pretty yellow wildflowers and grasses in here," he said. "I don't know if they'll come back." He showed me where someone had yanked out a Forest Service gate. More often, though, it's the Forest Service that has to yank out gates -- illegal ones put up by pot growers and such. Phillips said he's discovered four pot gardens since he's been with the Six. In addition, he's done a requisite three-week detail with CAMP each year. Last year he was sent to Lake, Mendocino and Colusa counties to roust out growers. But most of his dope busts involve smokers, not growers. Once, by a small lake, we saw a red truck with its driver's side door wide open and an empty dog carrier in the back. Phillips got out, looked around. Listened. He walked to the truck, glanced through the open door. Stood. Listened. He walked through the trees onto a ridge and listened some more. "The guy's shooting," he said when he returned. He'd seen spent rounds on the ground. "I don't know where he is. The door's open, he can't be far." We drove back out to Route 1 and up to a high point, where Phillips pulled over, stopped, lowered the windows and listened. Wind sighed in the trees. An engine muttered faintly in the distance then faded. No shots. The only people we ran into were workers further on, installing drain pipes in a Forest Service road. Phillips asked one of them if they'd seen anyone that day, fourwheelers maybe? They had not. We drove on, flushing groups of little gray-brown birds from the bushes. Occasionally a flicker beat past us on orange-tinged wings. We listened to scanner traffic. Up on Horse Mountain, where a bunch of repeaters are, Phillips told me he had busted up a couple of raves there. One had 300 people, dancing around massive bonfires. At another, he and three CalFire employees chased a guy on foot until they caught and arrested him. At the Brush Mountain Lookout, he said somebody had once broken into a building and stolen some stuff. We drove on. Often, Phillips said, he does some training reps when he's out here -- stop, pull his gun out. Repeat. So he doesn't get rusty. "Because you can go from mild, like this, to hostile right around the next curve," he said. "We have no backup out here, and we're 30 miles from nowhere." Usually he'll listen to country music as he drives, with the scanner cranked up. Does he ever stop on a high ridge to ogle the far-off peaks and eat a snack? Or by a little waterfall, say, in the woods? No. No favorite place he looks forward to? No. "It's all immaculate to me," he said. "I have one of the greatest jobs anybody could have, being in Mother Nature, driving through all this." We looped back to town by way of Route 6 and Friday Ridge Road, stopping often to investigate sawdust patches in the road and stray piles of firewood and telltale slaughtered stumps nearby. On the Six, only dead and downed trees can be salvaged for firewood, with a permit. But here was evidence of ongoing, large-scale carnage of live trees. 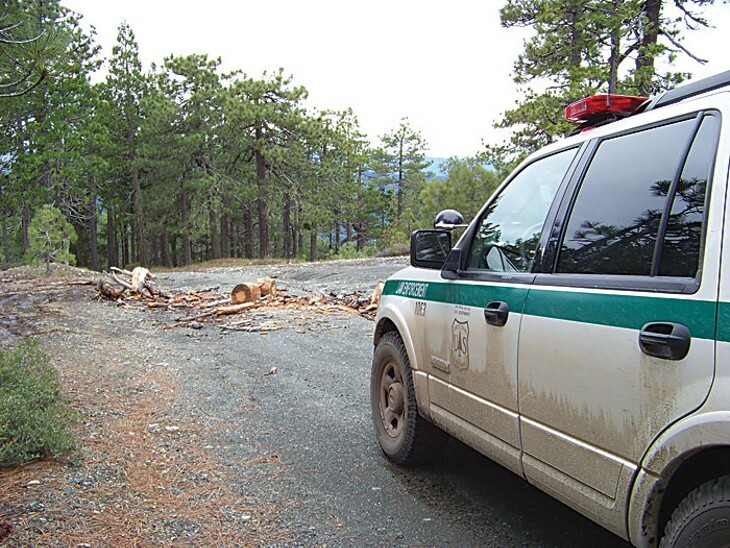 Phillips and a CHP officer recently caught one guy hauling out 16-foot madrone logs. It looked like a lot more trees had been cut since. He was itching to catch the thieves. Around 3 p.m., Phillips gassed up the rig at the Willow Creek Chevron and went inside to buy some potato wedges. He hadn't touched his fruit pies yet. Clerk Mindy Lovel, as she served him, told him somebody had poached a deer in the night and left a bloody mess up on Horse Linto Road. It really bothered her. They chatted awhile more, and then we left. Town doesn't draw Bobby Phillips. "I hate lines," he said, as he drove over Horse Linto Creek. And it's not like he can go hang out in a bar in Willow Creek to watch football; he might run into someone he's busted. He spends his free time remodeling his 1970s-atrocious house in Willow Creek or fishing in the backcountry. "People tell me I'm too set in my ways," he said, a bit shyly. But some folks seem to like him. On the phone recently, Willow Creek Community Services District Director Steve Paine said Phillips is the best law enforcement officer they've had out there. "He's very much [like an] old-fashioned law man, the kind who really got things done, did it in a good way and it worked," Paine said. "He is a throwback to that. He's been just a straight shooter, and busy as sin. And it even extends to the kids downtown when they're doing something wrong and he's passing through. He stops and gives them fair warning and straightens them up. He is a full-time police officer and he doesn't forget that and he doesn't look the other way." One night, said Paine, a camp host called him to complain that Phillips had taken his campers' booze away and poured it out. "And I said, 'Well uh, Joe, how old are they?'" said Paine. "I said, 'Are they 21?' He said, 'Well I don't know, they came up from Humboldt.' I said, 'Well, if they're underage, that's what his job is!'" Paine laughed, and continued. "And that's the thing about Bobby. You know, a lot of people, when they're in law enforcement after a period of time, modify their regime, fall back, find a place to get comfortable and read a book some afternoons. He's not at all that way. He's gung-ho, he does a heckuva job and it has a beneficial impact in the community. ... I imagine that if I was on the other side of the law, I'd be looking over my shoulder. If I was out there stealing wood, or growing dope on Forest Service land, or poaching ... I mean, there are a lot of people that are gonna be worried about Bobby Phillips. I'm very happy to have Bobby here."